James D. Julia's February 2-Day Auction to Feature Almost 1,200 Lots of Fine and Decorative Art, Antiques and Furniture, Historical Rarities, and Asian Selections. The sale features three absolutely breathtaking, new to the market collections of antiques and artwork from across the United States - all offered without reserve. 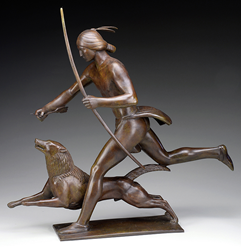 Paul Howard Manship, "Indian Hunter and His Dog", Estimated at $400,000-600,000. It’s time for the most anticipated premier auction of the season - James D. Julia's annual Winter Fine Art, Asian & Antiques sale to be held on February 9th and 10th, 2017 starting at 10am each day. Day one kicks off with over 375 lots of carefully curated paintings and sculptures, followed by almost 150 lots of exceptional Asian arts selections. Museum quality paintings are early key categories of this can’t-miss sale. Three highlights by American artists merit special notice. The first is lot #1125, Martin Johnson Heade’s Florida Pastoral. This remarkable work was acquired from the family of the artist, and is estimated at $300,000-500,000. This exact painting is included in Heade’s catalog raisonne; page 279, no. 346 in The Life and Works of Martin Johnson Heade by Theodore Stebbins Jr., 1975 and page 275, no. 295 in The Life and Works of Martin Johnson Heade A Critical Analysis and Catalog Raisonne by Theodore Stebbins Jr., 2000. The second is lot #1152, Eastman Johnson’s Girl And Pet Doll, which is estimated at $30,000-50,000. This charming painting was included in the estate sale of the artist’s pictures held at the American Art Galleries in New York in 1907. It was entry number 41. And it’s a party with the third, lot #1124, Martha Walter’s Along The Seine Celebrating Bastille Day. It is estimated at $15,000-20,000 and retains its gallery label from David, Inc., in Philadelphia, PA.
Fine paintings from overseas artists add some foreign intrigue to this sale. Lot #1223, Thomas Webster’s The Village Festival is cause for celebration. It is estimated at $10,000-15,000 and is stenciled on verso “Reeves and Sons, Manufacturers 113 Cheapside London.” Lot #1222, George Smith’s Searching For The Will, has its way with an $8,000-12,000 estimate. Smith assisted in the frescoes at the Houses of Parliament and is represented at the Victoria and Albert Museum in London. And two modern paintings of international note include lot #1258, Japanese artist Key Hiraga’s Surrealist Composition which is estimated at $8,000-12,000 and lot #1259, Indian artist Gulam Rasool Santosh’s The Pull which is estimated at $10,000-15,000. Julia's is recognized worldwide for its leadership in the categories of Maine and Cape Ann school paintings. This sale offers a fine collection of Rockport works, including examples by William Lester Stevens, Aldro Hibbard and Carl W. Peters, amongst others. Two must see highlights in this group are by Emile Albert Gruppe. The first, lot #1051, is his Drying Sails, Gloucester, which is estimated at $8,000-12,000. The second, lot #1050, is his Morning, Smith Cove, Gloucester, which is estimated at $10,000-15,000. Both feature peaceful dockside scenes. Day one of this sale also offers up some heavy hitting bronze selections, with several highlights originating from a private Connecticut museum. Lot #1040, Paul Howard Manship’s Indian Hunter And His Dog - one of a dozen 21” examples known - is estimated at $400,000-600,000. The last one to come to market was at Sotheby’s, New York at their 12/4/13 auction; it realized $1,565,000. According to Janis Conner and Joel Rosenkranz, Indian Hunter and His Dog was one of the artist’s most popular and widely recognized sculptures; it takes its inspiration in part from Manship’s recollections of his childhood in Minnesota. Lot #1197, John Gutzon de la Mothe Borglum’s Apaches Pursued By U.S. Troops, is estimated at $50,000-75,000. This dynamic sculpture was featured in Patricia Janis Broder’s 1974 reference Bronzes of the American West. Borglum is best known for his Mount Rushmore National Memorial. And lot #1225, Amandus Genrikh (Heinrich) Adamson’s Champion Lurich, is estimated at $10,000-15,000. This wrestling themed sculpture, based on world champion Estonian Greco-Roman wrestler and strongman Georg Lurich. It is suspected that this may be the only example of this extremely rare bronze that has come to the auction market. Day one rounds out with a full spectrum of top tier Asian items, including sculptures, artwork, cloisonné, jades and porcelain. This sale presents a nice selection of early and original scrolls including paintings and couplets. 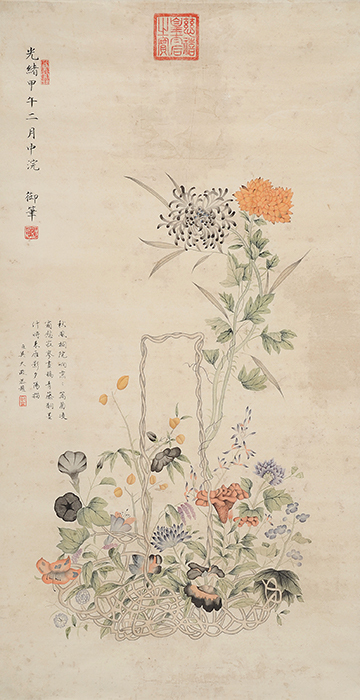 Lot #1603, a painting featuring an elaborate and colorful arrangement of flowers held within a handled basket, should bloom within its $15,000-20,000 estimate. It is signed “Emperor Guangxu.” And it is twice as nice with lot #1600, a calligraphy couplet, signed “Zuo Zongtang.” It is estimated at $8,000-12,000. 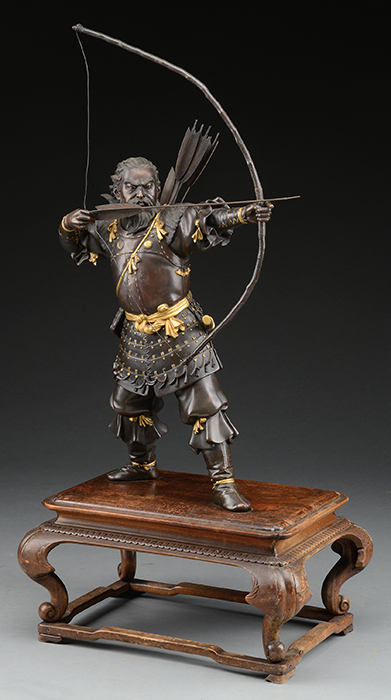 Lot #1537, a Yoshimitsu bronze Okimono of a standing archer, is estimated at $5,000-10,000. This Meiji-period masterpiece depicts a Samurai with his extended arm holding a bow and ready to fire. Collectors will want to put a lid on lot #1569, a jade covered vase, estimated at $6,000-8,000. This outstanding example is carved from a light celadon colored stone and is detailed with bands of archaic masks, a key fret design circling the body and dragon form handles. And lot #1570, a 19th/20th century Chinese cloisonné temple bell decorated with seated deities above a band of Taoist masks decorating the lower half, rings true with its $4,500-5,500 estimate. Auction day two tempts buyers with over 600 lots of outstanding American and European antiques, decorative arts, furniture, historical items and nautical paintings at center stage. There is truly something for everyone amongst these top-tier and expertly cataloged selections. 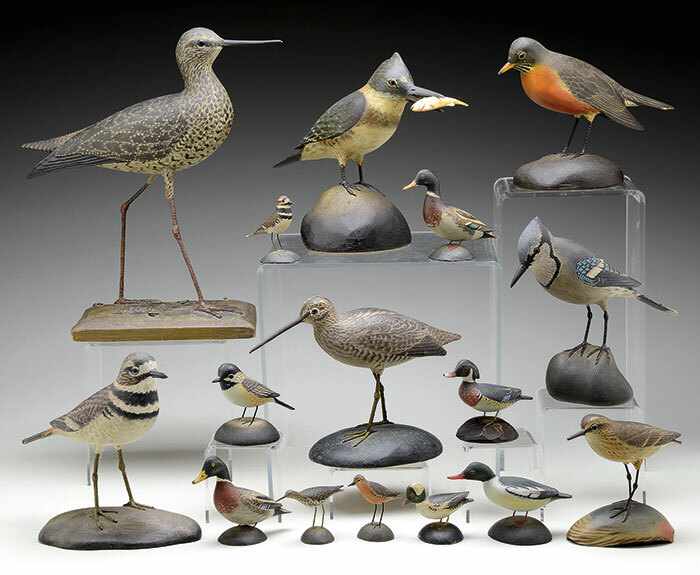 Day two launches with a remarkable collection of folk art and bird decoys, most offered without reserves. Fine carvings by Gus Wilson of South Portland, ME and A.E. Crowell, from East Harwich, MA are well represented in this grouping. Wilson highlights include lot #2000, a black duck decoy in a back preening pose, and lot #2002, a black duck decoy with an unusual cantered head which makes the bird appear to be looking up. They are estimated at $3,000-5,000 and $2,000-4,000 respectively. Crowell highlights include lot #2005, a very rare decorative and early Yellowleg with dropped and carved wings, estimated at $8,000-12,000, and lot #2006, an exceptional decorative Killdeer Plover, estimated at $6,000-9,000. And the eagle soars with two fine John Haley Bellamy carved and painted “Don’t Give Up The Ship” plaques. The first, lot #2078, has a white painted eagle with red and blue lettering on the banner. The second, lot #2079, has a gold painted eagle with red, white and blue lettering on the banner. They are estimated at $8,000-12,000 each. And on the subject of carvings, lot #2168, a tobacconist figure of an Indian Princess, really stands and delivers. This 19th century example, attributed to Thomas Brooks, is estimated at $75,000-150,000. She is detailed with a carved, bold headdress of four-color polychrome decorated feathers, a tasseled necklace, a dress with puffed and gathered sleeves, a fringed sash tied at the waist, fringed leggings and moccasins. She holds a block of tobacco plug in her right hand and a bundle of cheroots in her left. This comprehensive sale also features a boatload of nautically themed paintings. Lot #2061, Robert Salmon’s A British 18-Gun Snow Departing From The River Mersey is estimated at $30,000-50,000. Lot #2127, Thomas Hoyne’s Eliza Adams is estimated at $20,000-30,000. And two fine paintings by James Edward Buttersworth are certain to make waves with enthusiasts. They include lot #2080, his View Of Ryde And Pier, Isle Of Wight, Opposite Portsmouth and lot #2081, his Schooner Yacht "Wanderer" Off Belem Castle-Tagus River. They are estimated at $20,000-30,000 each. Fine silver is another sterling category in this auction. Lot #2054, a pair of silver spoons by Paul Revere, is estimated at $3,000-4,000. It is all in the service with lot #2440, an impressive c. 1910 sterling silver tea and coffee service by the French manufacturer, Tetard Freres. This lovely set is approximately 290 troy oz and is estimated at $8,000-12,000. And it’s bottoms up to a pair of top-notch, 18th century coin silver tankards from Boston, Massachusetts. The first is lot #2055, a large tankard by John Allen and John Edwards. It is estimated at $7,000-9,000 and features a tapered cylindrical body, S-curve handle, and a scroll work thumb piece attached to the dome cover. And the second is lot #2056, a tankard by John Burt. It is estimated at $4,000-6,000 and has a tapered cylindrical body, ring molding, and an onslow style thumb lift attached to its domed cover. Let’s now point our attention to this sale’s great selections of antique weathervanes. It’s off to the races with lot #2105, a rare and important horse and rider weathervane by J. Howard & Co., estimated at $60,000-80,000. 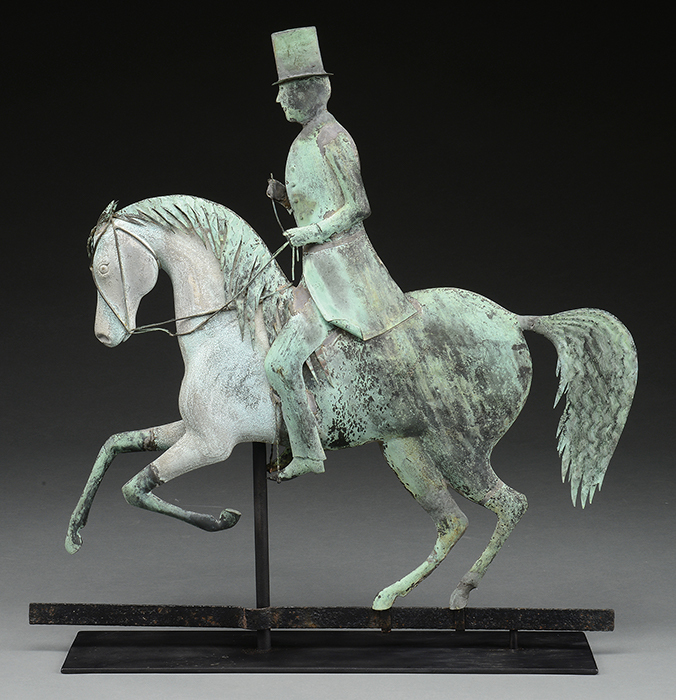 This molded cast zinc and copper example, with history connecting it to Frederick Douglass, features a gentleman in a long coat and top hat holding a riding crop atop a prancing horse. Lot #2121, a sportsman dog weathervane, is estimated at $10,000-15,000. This molded copper canine was produced in the last quarter of the 19th century and is attributed to Thomas W. Jones, New York, NY. And collectors will undoubted take aim at lot #2120, a late 19th/early 20th century monumental standing Mashamoquet Indian shooting a bow and arrow weathervane. It is estimated at $40,000-60,000. Choice antique and important furniture has always been signature categories for Julia’s. Lot #2109, a 1750 Queen Anne transitional mahogany blockfront bureau table is estimated at $20,000-30,000. This rare and handsome example is made of high grade Santo Domingo figured mahogany and probably from Salem, Massachusetts. Lot #2396, a Warren McArthur armchair with its original paper label, is estimated at $2,000-4,000. This stunning chair was most likely commissioned for the 1932 wedding of Marion Nichols and William Payson Viles. The Viles lived in New York City until returning to the family home in Augusta, Maine in 1950. Also important to note here is a fine selection of Chippendale furniture. 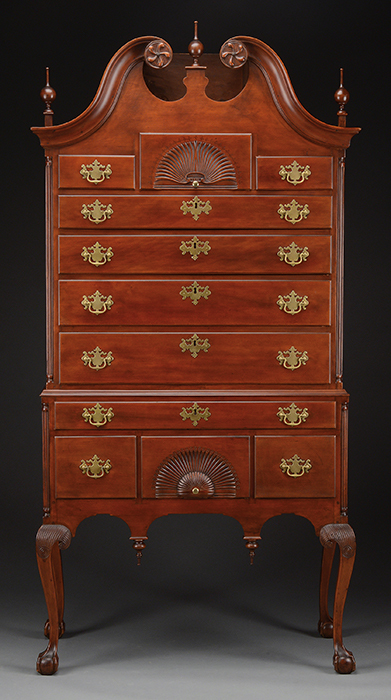 Lot #2131, a c. 1775 fully developed cherrywood bonnet-top highboy from the Colchester, Connecticut area is estimated at $75,000-150,000. This exceptional piece compares most favorably in design, cabinetwork, and carving to all examples from the Connecticut Valley and its proportions and overall unity are enhanced by superior drawer organization and highly developed carvings. And lot #2132, a c. 1775–1790 figured mahogany secretary bookcase is estimated at $5,000-8,000. This particularly bold blocked end serpentine example is detailed with robust claw and ball feet and a center drop. It wouldn’t be a Julia’s auction without some remarkable and unexpected historical items, archives and flags, and this sale more than delivers in these important areas. Lot #2024, an exceptional collection of 1800-1864 Charleston, South Carolina, “slave hire” occupational tags is estimated at $90,000-125,000. Charleston was the only city in the antebellum South to issue these tags which had to be worn by any slave that was “hired out.” Each year a slave owner who hired out a slave had to pay a tax and the slave had to wear a brass “slave tag” to prove the tax had been paid. This is undoubtedly the finest and only complete collection of slave tags extant. Bidders are also certain to do battle over this sale’s fine selections of American militaria, including firearms and swords. Three key selections merit the spotlight here. The first is lot #2026, a c. 1850-1855 Naval Officer’s sword belonging to Commodore Matthew Perry, estimated at $25,000-50,000. This example is among the earliest regulation Model 1852 US Navy Officers swords known, and comes with complete provenance, Perry’s extensive biography and research notes. The second is lot #2037, an extremely rare 1773 Colonial-Revolutionary War military American fowler by Thomas Earle, estimated at $20,000-30,000. There are only about half-a-dozen authentic examples of this firearm edition known. Other New England fowlers use French components, but this one, like others by Earle, is 100% American. Earle was known as one of the finest firearms manufacturers of his time and was personally commissioned by George Washington to make a custom fowler for the Commander in Chief of the Continental Army. And the third is lot #2027, a fabulous Civil War-era silk embroidered Cavalry flag and sword of Captain George Alexander Hotmer, Squadron B, 3rd Regiment Cavalry, New York National Guard. This pair is right on point with their $4,000-6,000 estimate. The flag is embroidered silk, measures 47″ x 29″, and is presented in an old wooden frame. It is illustrated with a Civil War officer with flourishing swords mounted on a horse, rallying troops to battle. The sword is a Model 1850 with a rare silver grip and sharkskin scabbard. Both items come complete with full provenance. This sale features a number of historical archives, including two important Civil-war era collections. The first, lot #2021, is an archive of materials from the Confederate Secretary of the Navy, Stephen R. Mallory, which is estimated at $8,000-12,000. This grouping includes a portrait of Mallory in its original gilded frame, three copies of his bound diaries, his appointment signed by Confederate President Jefferson Davis and Secretary of State William M. Browne (which is done in calligraphy with the applied embossed seal of the Provisional Government of The Confederate States of America,) and a small circa 1820-30 sword with regimental markings, most likely 2nd Battalion, Cadiz Regiment. The second archive, lot #2025, is a collection of materials from Captain Luis Emilio, including his presentation Ames 1850 staff officer’s sword. This grouping is estimated at $50,000-75,000. Emilio carried this sword as an officer with the famous Black Regiment, the 54th Massachusetts, and it was with him at the assault of Ft. Wagner on July 18, 1863. In addition to this sword, the collection includes a portrait of Emilio in an original gilded frame with its original canvas backing and Emilio’s handwritten tag on verso, as well as one of a set of “LFE” embroidered linen towels. In February, 2014, James D. Julia sold two archives of photographs, letters, and diaries of Emilio’s; they realized for $59,250 and $148,125. We know of no other swords of 54th Mass. officers that were actually at Ft. Wagner ever previously offered at auction. And finally, everyone knows by now to expect the unexpected at Julia’s semiannual Fine Arts, Asian and Antiques auctions. This sale includes a number of outstanding, unusual and really interesting items that just don’t fit cleanly into any category. Lot #2091, a rare pair of celestial and terrestrial globes by John Senex (1678-1740) just may spin collectors into orbit. They are estimated at $30,000-50,000. Lot #2151, an early 1900s, 66” long green painted wood and canvas canoe model is estimated at $12,000-18,000. It was made by the Kennebec Boat & Canoe Co. of Waterville, Maine. These sample canoes were created for advertising purposes, hung in shops, and were used as salesman’s samples. Generally these canoes were about 48” long, and were given to accounts that ordered rail boxcars of full-size canoes. Larger sample canoes, like this one, required a greater purchase or a special order. And there’s music in the air with lot #2394, an outstanding 1961 Fender Stratocaster electric guitar with sunburst finish, estimated at $3,000-5,000. This instrument, which retains its original case, is neck dated “12/61” and body dated “12/61” via pencil inscription. More information on James D. Julia's outstanding two-day Winter Fine Arts, Asian & Antiques auction, as well as the full catalog, can be found online at http://www.jamesdjulia.com. This auction is fully documented in a full-color, detailed and illustrated print catalog. It is available for $40. In addition to pre-bids, telephone bids and in-person bids, James D. Julia accepts bids via Invaluable.com as well as Bidsquare.com. Bill Gage, Tony Greist and Katya Tilton welcome your questions and inquiries; they can be reached at antiques(at)jamesdjulia(dot)com or by calling 207-453-7125. This event will host its preview in Fairfield, Maine, on Wednesday, February 8th from 9 am to 5 pm, Thursday, February 9th from 8 am to 10 am, and Friday, February 10th from 8 am to 10 am. Special previewing can be arranged by appointment. The auction will be held on February 9th & 10th, 2017, beginning at 10am each day at Julia’s facilities at 203 Skowhegan Road in Fairfield, Maine. James D. Julia, Inc., one of the top ten antique auction antique houses in North America as measured by annual sales, is headquartered in Fairfield, Maine. The company also has an office in Boston, Massachusetts. In business for over 45 years, the company conducts high-end antique, collectible and fine art auctions throughout the year. Julia's has routinely established new world records through its auctions. The company consists of three key divisions, including Rare Firearms; Fine Art, Asian & Antiques; and Rare Lamps, Glass & Fine Jewelry. Each division is regarded for its excellence and is staffed with world-class specialists to guarantee fair and professional authentication, identification and valuation services. For more information on James D. Julia, Inc., please visit http://www.jamesdjulia.com. 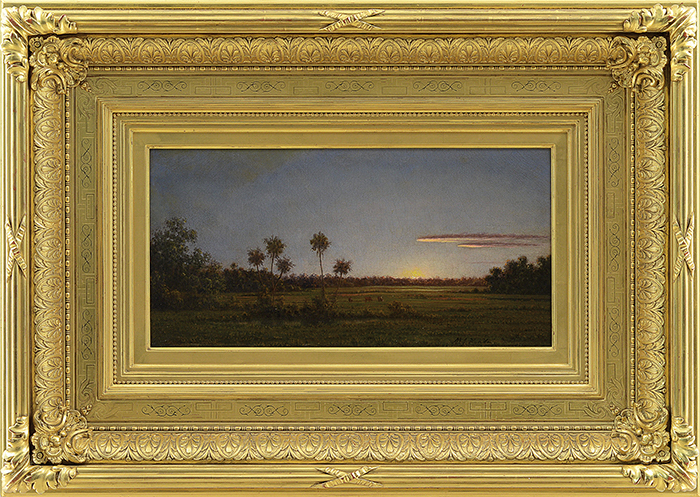 Martin Johnson Heade, "Florida Pastoral", Estimated at $300,000-500,000. 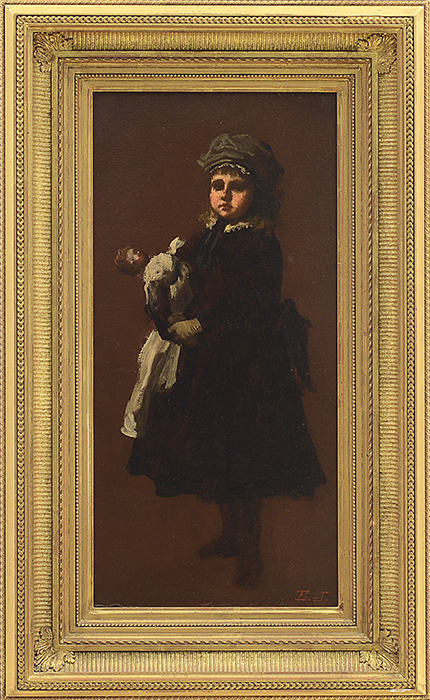 Eastman Johnson, "Girl and Pet Doll", Estimated at $30,000-50,000. Yoshimitsu Bronze Okimono of Standing Archer, Estimated at $5,000-10,000. Scroll Painting, Signed Emperor Guangxu, Estimated at $15,000-20,000. Collection of A.E. Crowell Bird Carvings and Decoys. 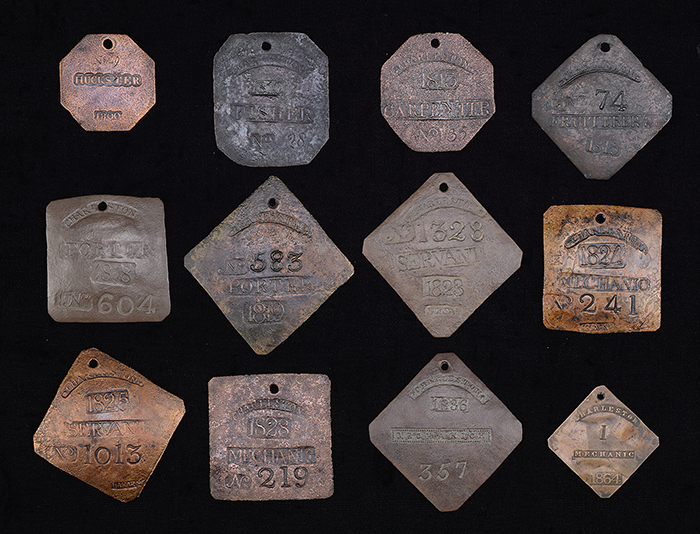 Collection of Charleston, SC, "Slave Hire" Occupational Tags, Estimated at $90,000-125,000. 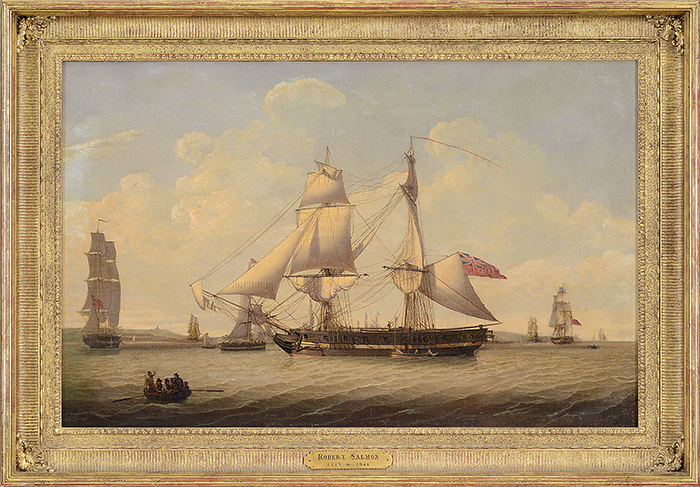 Robert Salmon, "A British 18-Gun Snow Departing from the River Mersey", Estimated at $30,000-50,000. Horse & Rider Weathervane by J. Howard & Co., Estimated at $60,000-80,000. Chippendale Cherrywood Bonnet-Top Highboy, Estimated at $75,000-150,000. Carved & Paint Decorated Tobacconist Figure of an Indian Princess Attributed to Thomas V Brooks, Estimated at $75,000-150,000. 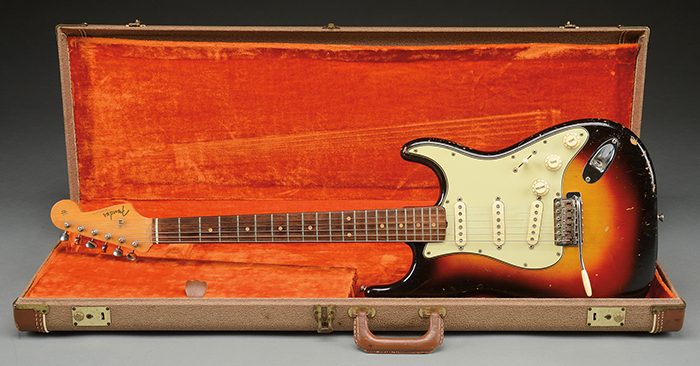 1961 Fender Stratocaster Electric Guitar, Estimated at $3,000-5,000.